Gordie Howe's career lasted so long that he played alongside his sons Marty and Mark Howe while with the WHA's Houston Aeros and Hartford Whalers. We were at the NHL All-Star Game in Sunrise, Fla., home of the Florida Panthers, a few years ago, and I was standing outside the NHL.com office, talking to a team executive, when I noticed Gordie Howe approaching, deep in conversation with a group of people. In that circumstance, I was thinking a nod and a smile would be sufficient, don't interrupt the man. Instead, Howe broke off his conversation, crossed the aisle and gave the two of us a big smile and a handshake and asked how we were, how the family was. Jeepers, Gordie, I was thinking, I should be the one making my way to you. "Gordie drives a minivan, it's his favorite car," says Travis. "So he was pumping gas into it one day when a man got out of his car and recognized Gordie. The man started saying what a genius Gordie was, what a great disguise, to drive a minivan when everyone would expect he'd be driving something more expensive. "Gordie just laughs when he thinks about today's salaries for professional athletes," Travis continued. "He talks about having to have two jobs to make ends meet when he was first playing in the NHL. Nevertheless, he still felt very fortunate to be able to play in the NHL." 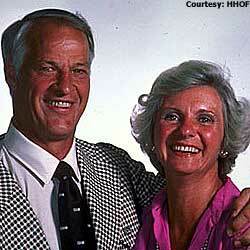 That's Gordie Howe, a man who has been famous for 60 years but doesn't "big time" anyone. A man who raised a family whose members are industrious, successful and, like Gordie, respectful to all. Gordie Howe: The man who has probably signed more autographs than any living human, always with a smile and a joke. Gordie Howe, in advance of his 80th birthday March 31, was feted in Vancouver earlier this month, and son Mark Howe told Ian Walker of the Vancouver Sun an illustrative story. During the 1960s, Gordie was affiliated with the Eaton's department store chain and would make appearances all across Canada, signing autographs and talking to fans. "The lines would be thousands of people long and he'd sit there and sign everything and laugh and kid with people," Mark Howe told Walker. "The part people didn't see – say our day would end at 8 p.m. that night. We'd go back to the hotel and get a little something to eat and what he would do – they had these little cards of Dad in a Red Wings uniform and had Eaton's written on it – Dad would sit and sign them until 11 or 12 at night. He'd try to get in 2,000 to 2,500 every single night." Howe then was able to chat comfortably with people and learn something about them. "He would then personalize the card and joke and jest with everybody," Mark Howe said. "It would allow him to be who he is. That's who my dad is. He was down to Earth, never aloof with anybody or thought of himself better than anyone." "My Mom and Dad, my Dad especially, were emphatic that we were no better than other people," said Dr. Murray Howe, the head of the radiology department at Flower Hospital in Sylvania, Ohio, northwest of Toledo. "My dad said it succinctly: 'Don't read your own press clippings because you might start to believe them. The press may be good to you but they may be bad, too.' I always remembered that." Murray is the youngest of Gordie and Colleen Howe's four children. He was born in 1960, a year after his sister Cathy, five years after Mark and six years after Marty. 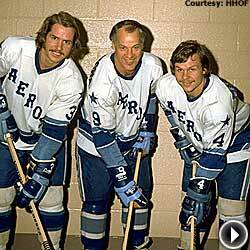 The latter sons were Gordie's teammates with the Houston Aeros and Hartford Whalers of the World Hockey Association. Murray was a pretty good young hockey player who followed his older brothers into Toronto youth-hockey programs. He even played a season with a young Wayne Gretzky. He made a determination, though, that his future lay in medicine, not hockey. Even though his parents never pressured him to play hockey, Murray said he approached with trepidation the call to inform his father of his career path. "My parents are the most down-to-earth people," Murray said. "They came from humble origins and my granddad, Gordie's dad Albert, made sure you weren't too big for your britches. My mom's parents are the same way. That would be my Aunt Elsie, my grandmother's sister-in-law, a very down-to-earth farm woman. She told mom, 'Always do right and don't think too much of yourself. "When my mom was very young, my grandfather and grandmother broke up, although he returned later in life. That was taboo in the 1930s, so my grandmother struggled. She was a waitress and she had my mom at the bar most of the time. It was not a good scene, so she sent Colleen to live with Elsie and Uncle Hughie, the greatest people on earth. They were humble farmers who took my mom in and raised her. As a result, my mom became outgoing and optimistic where, before, she had no reason to be. They helped her become self-assured, confident and happy, and we benefited from that." Murray was asked what life was like when their father spent the better part of nine months split between home and the road. "Mom never complained and she did what needed to be done," Murray said. "She felt it a privilege to be part of a family, after her childhood. She was always excited when Dad came back from a road trip and so were we. She made sure we understood Dad wasn't abandoning us, that he was doing his job and she was doing hers." Absent fathers sometimes have difficulty conforming to Mom's strict rules for the kids when Dad's time at home is limited. There was no such conflict in the Howe household, Murray said. "My mom is a very assertive person, and off the rink, my dad is not. He is a quiet gentleman," Murray said. "He always knew he married well so he would defer to her if she had laid down a law. He might have a discussion away from us but he always honored her rules and her judgment. She is a strong, strong person and that's what my Dad needed, being in the public eye and away from home a lot." "I got credit for a lot of things she made happen," Gordie said. "She is very creative and did a hell of a lot for the family." Murray made an interesting point about how large salaries earned by professional athletes can impact their children. Gordie's first contract paid him $2,350 for the season. While Gordie and Colleen probably wish salaries had been higher in Gordie's day, Murray thinks it worked out fine for the children. "People ask me if I don't regret that Gordie didn't make what players today earn and I say no," Murray said. "Other than the fact my dad did his job very well and people knew that, he was no different in our neighborhood than any other father raising a family. We grew up in a humble neighborhood with lots of kids and every family's door was open to us and ours to them. We walked right into any of our friends' houses without knocking. It was a wonderful time and place to grow up. It really was a blessing because we were not separate from other people. We didn't feel different or privileged and that was great. I would have hated growing up in a gated community." 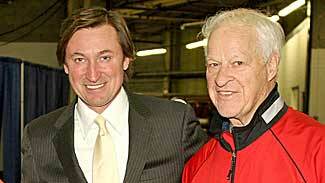 Informed of those comments, Gordie responded in typical fashion: "Hmmm, he's smarter than I give him credit for being." Right, Gordie. That's your son, the doctor. But Gordie knows no other way. As he was becoming famous back in the late 1940s, his father was asked to describe his star son in his earlier years. Gordie and Colleen Howe will celebrate their 55th wedding anniversary on April 15, 2008. If Gordie or his dad weren’t there to put you in your place and keep you there, Mom was, Murray said. There was to be absolutely no trading on Dad's fame. "They all laughed and left and my mom explained that I had to earn my own credibility in life. That was a great lesson for me. I never again told people of my bloodlines. If they figure it out, I don't deny it but I don't make it a point of conversation." Murray Howe got his medical degrees at the University of Michigan and interned at Detroit's Henry Ford Hospital. He worked with injured Red Wings and Detroit Lions players for a few years before moving to Ohio. Murray's medical knowledge played an important role in understanding Colleen's Pick's disease a few years ago. The illness is very similar in symptoms to Alzheimer's disease but is treated differently. Colleen initially was treated for Alzheimer's without improvement. A change in medication has helped her condition. Colleen is unable to talk, and Gordie admitted a few years ago that her illness sapped a lot of his strength. The family has responded. Travis, 29, a former high-level youth-hockey coach in upstate New York, moved into their home. Mark and Marty keep an eye on Gordie's business interests and travel with him frequently. Murray monitors their health concerns. While at Michigan, Murray met and married his own Colleen, one of the few female engineering students at that time.